The Erasmus Mundus is offering scholarships for the European and non-European students to pursue masters in Europe. The applicants for MaMaSELF Scholarships, 2017 should be from the non-European country and belong to the "partner countries" (all countries of the world with the exception of the 28 EU Member States, Iceland, Norway, Liechtenstein). The candidates should be citizens of a third country. The applicants from Turkey can also apply. The applicants should not be residing in any UE Member State or participating country. The candidates should not have carried out their main activity in any of the EU member states or participating countries for more than 12 months in the last 5 years. The recipients get 21,000 Euro per year. The applicants for MaMaSELF Scholarships, 2017 should be graduate students from one of the 28 EU Member States, Iceland, Norway, Liechtenstein, Turkey or the Former Yugoslav Republic of Macedonia. The duration of the program is for 2 years. 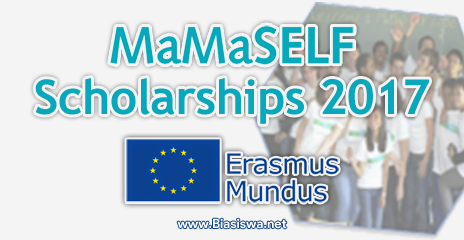 The recipients of MaMaSELF Scholarships, 2017 get 20,000 Euro for two years towards travel and living expenses. 29 January 2017 for non-European students. 26 February 2017 for European students. 15 May 2017 final deadline for all students.